Rich Communication Services (RCS) has been a hot topic in the press of late, with early success stats already being reported from live American brands. The European launch is imminent, so we’re presently undergoing an RCS onboarding process for our customers across Europe. The onboarding process is a list of steps that a brand needs to complete in order to send RCS messages to their customers. This is known as registering your brand’s agent. Send your first rich message! Why do I need to verify my brand? Verified Sender is one of the most important characteristics of RCS. This process will detail specific elements of your brand such as, name, logo, colour and contact details. The process of verifying your brand with a trusted authority such as Google or Vodafone means that the channel is exceptionally secure and should help to eradicate spam from the telecommunications industry. 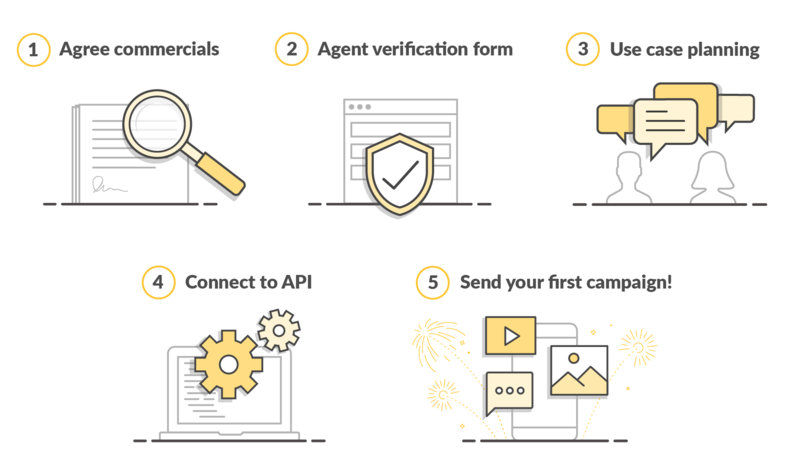 It is not possible to send an RCS message without first having completed the agent verification form, consequently, it is believed to also help to improve consumer trust and engagement. Why should we register for RCS before it’s live? If RCS launched in the UK tomorrow, it could take a few weeks to get your account verified and then you’ll need to create an effective RCS use case. This could mean that you lose your competitive advantage, as other brands enter this digital space. What happens if my customers don’t have an RCS-enabled device? We are aware that not all phones will be RCS-enabled from the start. Consequently, we have created an intelligent fall-back in the form of our Landing Pages product. When sending a rich message campaign, our systems will detect whether or not the end user’s phone is RCS capable. If it is, then an RCS message will be sent, if not, the end user will receive a Landing Page message. This ensures that every customer can receive an enhanced and more engaging messaging experience. How will I know how many messages were sent as RCS and how many as a Landing Page? The report that you receive after a campaign is complete, will detail how many messages were sent as an RCS message and how many were sent as a Landing Page message. The invoice will also detail this information, with RCS messages having their own separate line on the bill. This will enable you to understand the true ROI of this activity. How do I create an RCS campaign? Once access to Messaging Studio has been granted, your Account Manager will work with you to create the most effective use case for your brand. This will include reviewing your existing SMS campaigns, as well as discussing your overall communication goals and how rich messaging can support this strategy. Then, simply design one rich message campaign in Messaging Studio and our systems will either send this as an RCS message or as a Landing Page message, depending on the capabilities of the end user’s device.